As billions of gallons course through Albany, is it worth the risk? 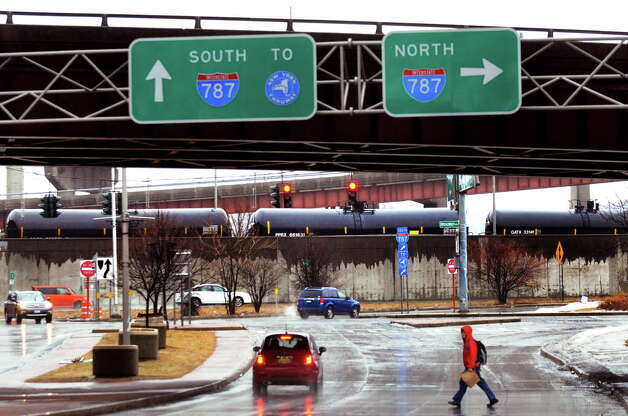 The risks of oil trains rolling through Capital Region neighborhoods are well-known. Bakken crude is flammable, even explosive, and derailments elsewhere have destroyed property and forced evacuations. And the memories of Lac Megantic, Quebec, where four dozen people died following the July 2013 runaway train disaster, remain vivid for people who live along the tracks. But what does the Capital Region economy get in return for the risks? An accurate accounting of the economic impact is elusive, largely because the two major players locally — Waltham, Mass.-based Global Partners and Houston-based Buckeye Partners — have been silent about activities in the terminals they operate at the Port of Albany. Global said Friday it employs "more than 40" people at its Albany terminal, with annual direct labor costs of $3.5 million in its most recent fiscal year. Buckeye didn't respond to requests for comment. Both terminal operators pay school and city property taxes. According to city Treasurer Darius Shahinfar, Global Partners pays about $540,000 a year; Buckeye Partners pays about $345,000. The taxes are based on assessed valuations of $11.6 million for Global and $7.6 million for Buckeye, Shahinfar said. The assessments don't place them among the 10 largest taxpaying parcels. National Grid ranks first, with assessed valuation of $112.8 million. Chapel 24 Hotel Assoc. ranks tenth, with assessed valuation of $14.1 million. Albany Common Council member Michael O'Brien questions whether the tax revenues the two terminals produce are appropriate based on the 2.8 billion gallons of crude they can process annually. "($800,000) is better than nothing, but it strikes me as low," he said. Global also pays fees to longshore workers who handle the barges at the Port of Albany. General Manager Richard Hendrick said the 263 tug/barge units handled last year and the 95 so far this year have produced another $225,000 in dockage charges to the port. In addition, "there are security charges on every visit of the Afrodite," a tanker that travels between the Buckeye terminal and the Irving Oil Co. refinery in St. John, New Brunswick, "and (on) visits of barges when there are no other ships in port," Hendrick said. He estimated that longshore workers put in at least 80,000 hours last year, or the equivalent of 40 people working 40-hour weeks for 50 weeks. The two companies are considerably different in size, but both are profitable. Buckeye has a market capitalization — the value of each share multiplied by the shares outstanding — of $9.9 billion. Global has a market cap of $1.1 billion. Global Partners earned $30.4 million in the first quarter of 2015, down from $57 million a year earlier. Net income at Buckeye Partners L.P. rose to $111.6 million in 2015's first quarter from $90.5 million a year earlier. Hendrick, asked about employment at the two terminals, said it was likely in the dozens, but not in the hundreds. Global subsequently provided the "more than 40" figure. The port's role has produced more train traffic in the area. Hendrick estimates more than 700 trains arrived there last year. With 100 tank cars per train, that's 70,000 cars. Yet crude oil shipments account for a relatively small share of overall freight traffic, according to figures from the Association of American Railroads. In 2014, 493,126 of the 28.7 million carloads and intermodal shipments consisted of crude oil tankers, or 1.6 percent of the total. Crude shipments nevertheless were up 21 percent from the 407,761 crude oil carloads handled in 2013. Two railroads, CSX and CP Rail, deliver oil trains to the Capital Region. In CSX's case, some of those trains continue past Albany directly to refineries along the East Coast. But much of the oil delivered to Global and Buckeye travels on the Hudson River. The tanker Afrodite makes regular round trips between the Buckeye terminal and the giant Irving Oil Co. refinery in St. John, the destination of the train involved in the deadly Lac Megantic derailment. Barge traffic heads to refineries in New Jersey and Pennsylvania. The waterborne oil shipments, plus the fact that the rail lines follow closely along Lake Champlain and the Hudson and Mohawk rivers, pose environmental risks as well, activists say. Meanwhile, the second anniversary of the Quebec disaster is two weeks away. People of Albany United for Safe Energy, or PAUSE, will mark the occasion with a rally July 6 in front of the Governor's Mansion.